#1 Like a good Boy Scout… Be Prepared! When traveling in colder climates one must always be ready for whatever you may encounter. Yes, this is common sense… But how many of us jump in our vehicle when the weather looks nice and end up in a storm? Plan long trips carefully—what weather conditions may you encounter? Professional drivers are required to inspect their vehicles before every trip. We do a visual, hands-on inspection and check all important items, including tires, wiper blades, fluids, and lights. Check your vehicle more often due to temperatures. Most winter accidents occur because drivers are going too fast for road conditions. A slower speed gives you more time to react if something occurs. Hydroplaning happens more frequently at higher speeds, including loss of control due to slush. Extra patience and care for other drivers can help a lot. Following distance… Allow for more room between yourself and other vehicles. You should always have enough space and time to move out of harm’s way. Sudden, sharp moves can quickly cause you to lose control of your vehicle. 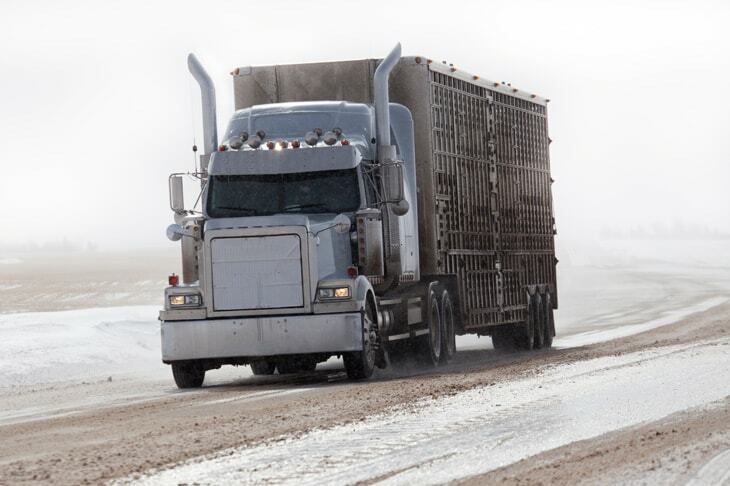 Keep your vehicle steady through ruts in the road, heavy wind and on ice. Keep both hands on wheel. Try not to do anything forcefully in bad weather. Anti-locking Braking Systems (ABS) can be your friend when used properly. If your vehicle has an anti-locking braking system (ABS), you should press and hold the brake down as far as possible in an emergency. The ABS prevents the wheels from locking, enabling you to steer around obstacles. If not equipped, when you need to slow down quickly in slippery conditions, try lightly pumping your brakes. This reduces your chance of locking your tires and spinning out of control. #7 Watch for black ice! Elevated structures, such as bridges and highway overpasses, usually freeze first, and many are not treated with ice-/snow-melt materials (salt, sand) like the rest of the road. Often vehicles are traveling fine on the highway, but as soon as they get on a bridge, they spin out of control. Black ice is often found on bridges. Mountain weather can be severe and unpredictable in winter, often changing rapidly. Be ready for wind gusts and watch and/or listen for emergency vehicles and snowplows. If at all possible, do not stop in avalanche zones. Obey posted rules, each state varies. Tire chains may be required for certain routes. Safety authorities post warning information for a reason. I curve posted at 35 mph is posted as such because testing has determined that that is the maximum safe speed for ANY vehicle. If you get stuck in a bad storm, blizzard, slide off the road, and you can’t see a close place to seek assistance, stay put! It’s easy to get confused in a bad storm, and you may get lost. Bundle up. You should also keep moving to stay warm. Avoid carbon monoxide poisoning, keep the exhaust pipe clear of snow, and open a downwind window slightly for ventilation. Run your engine for only 10-15 minutes each hour. Don’t push your luck and assume that plows have treated the roadways. Use your best judgment. Listen to weather reports and warnings and react appropriately. Aim High in Steering: Make sure you’re looking far enough ahead of your vehicle, so you have time to react to any hazardous situation. Get the Big Picture: Look all around your vehicle. Keep Your Eyes Moving: Continuously scan the entire area. Leave Yourself an Out: Always have an escape plan for you and your vehicle. Make Sure They See You: Make other drivers aware of your presence.